North Penn's Salsa Club captures the winning title at last year's cup. TOWAMENCIN- The month of October marks the annual World Cup soccer tournament between North Penn High School’s world language clubs. 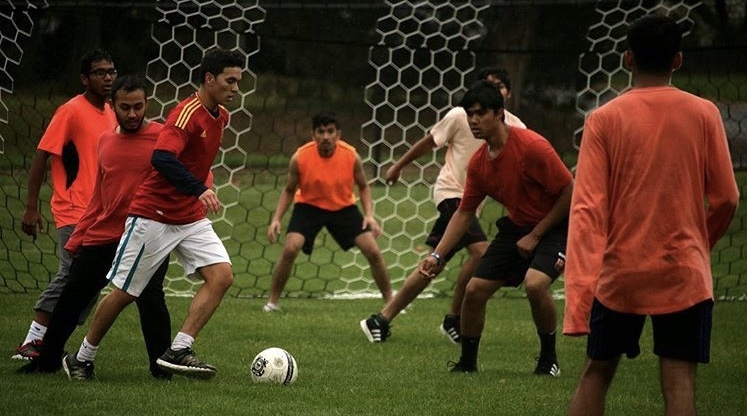 The World Cup has brought students together to participate in a friendly soccer tournament for nearly ten years, but the game this year has an unique twist in that it gives players the chance to donate money. Herr Baker, the advisor of German Club, coordinates the annual competition. German club along with Salsa club, French club, the International Friendship club, Japanese club, Bengali club, and the Korean club are all competing this year. Having a wide variety of teams participating is an important aspect of the tournament, as the World Cup is a significant event to many across the globe. The teams are split between two divisions. Every team plays against the teams in their division. The competitors in the final game are decided by which team from each division has the most points. This year, the tournament is acting as a fundraiser. Each player donates $2, and the winning team decides what organization receives the money. This presents students the opportunity to engage in an entertaining game of soccer, while helping those in need. “The number one rule is that it is a friendly tournament…Also now we can make it into a fundraiser. It usually had the one aspect [of playing soccer]. I’m excited to see where the money goes,” commented Herr Baker regarding the new incentive added to the tournament. The soccer tournament proves to be an enjoyable way students can compete against their peers and cheer on their teammates. Everyone who is a member of the clubs competing can play. There is no skill level required. The gathering is simply a fun way students can unite and play soccer for a beneficial cause. Bridget Gallagher, a senior at North Penn, recalls being a manager for the German team last year. “The tournament is very fun and competitive…There are a lot of cheerleaders too. Last year we got some of the marching knights to play for the game,” said Gallagher. The tournament will be held at Snyder Road Field after school on October 23rd. Members of the clubs competing still have the opportunity to participate, but must sign up as soon as possible. Even if students are not playing in the tournament, they are still welcome to attend and cheer on their peers.